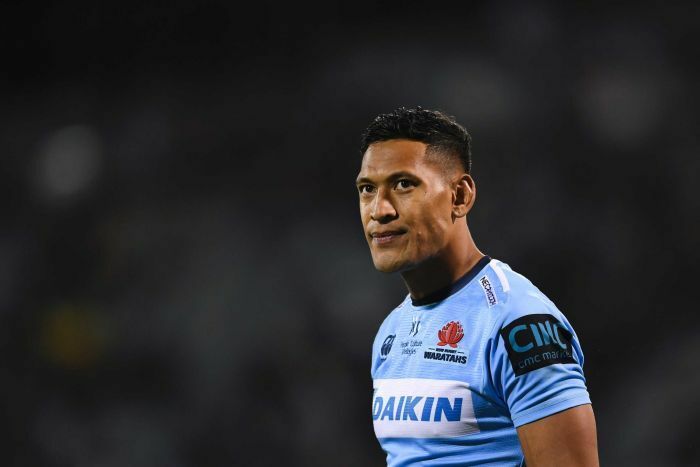 Past and present rugby union figures have joined the LGBTQI community in speaking out against Wallabies and Waratahs star Israel Folau following his anti-gay comments on social media. Folau’s future in rugby is again in doubt following another pair of explosive online posts featuring memes that insult a range of people, from homosexuals to “fornicators” and drunks. Rugby Australia released a statement condemning the comments by the former NRL and AFL star, who is a devout Christian, and the organisation now faces a dilemma about Folau’s future in the sport just five months before the World Cup in June. Folau is under contract until 2022, has won 73 caps and is a key part of Michael Cheika’s plans for the tournament in Japan, but he last year garnered widespread criticism over similar online behaviour. Israel Folau Insta: Those that are living in Sin will end up in Hell unless you repent. Jesus Christ loves you and is giving you time to turn away from your sin and come to him. He had previously said he was prepared to walk away from rugby if the situation became untenable due to his Christian beliefs. Folau was heavily criticised for a post on Instagram last year in which he said God’s plan for gay people was “HELL”. His latest posts drew fire from several organisations. “Folau’s comments are just one example of how much work is still left to do to combat discrimination and the use of hateful language against lesbian, gay, bi and trans people,” said Kirsty Clarke, director of sport at British-based LGBT charity Stonewall. “It’s important that Rugby Australia have stepped up to challenge Folau’s abusive comments. Gareth Thomas tweet: I don’t write this with hate or anger after Israel Folau’s comments. I write with sympathy. To everyone who reads it, don’t be influenced by his words. Be the better person and be YOU. Whoever YOU is..
Former Wales international and British and Irish Lions skipper Gareth Thomas, who came out as gay in 2009, responded to Folau’s comments on Twitter. “I don’t write this with hate or anger after Israel Folau’s comments. I write with sympathy,” the 44-year-old wrote. Thomas hit the headlines last year when he posted an image of his bruised face after he was assaulted because of his sexuality in the Welsh capital, Cardiff. English rugby international Joe Marler, who was a member of the British and Irish Lions tour of New Zealand in 2017, took a different approach to Folau’s comments. Rather than using words, he responded to Folau’s posts with tweets featuring pictures of men kissing. International Gay Rugby, the global organisation for the world’s gay and inclusive rugby clubs, also hit out at the 30-year-old. “The effects these hateful comments will have on LGBT people are enormously harmful,” the organisation said in a statement. “We want all LGBT athletes out there to know that rugby is a sport where you are welcome and respected, a sport of values that doesn’t allow for such bigotry or discrimination of any kind. Rugby fans responded online to Folau’s comments, with many suggesting the Wallabies star should face action from Rugby Australia. Chris Devine tweet: 1.3 seems relevant for Israel Folau given his Instagram and Twitter postings today.